In Paris this past week, through the flash of Instagram live streams and tears of celebrity guests walked the defining looks of the upcoming Spring/Summer 2019 fashion season. Haute Couture week in Paris acts as the precipice of fashion, featuring dramatic bespoke pieces that will sell for thousands and go on to influence ready-to-wear lines presented later in the year. Trend forecasters and fashionistas alike look to this week to see what the courtiers of the world have deemed to be en vogue in the coming seasons. A staple of haute couture is the finale of wedding dresses traditionally featured as the closing pieces of the show (Fashionista). The piece de resistance for most couture shows, these wedding dresses exhibit to the fullest extent the styles, methods, and concepts being expressed by the designer. Like the rest of the line they, at the grace of the consumer, go on to influence fashion trends, particularly the trends within the wedding industry. 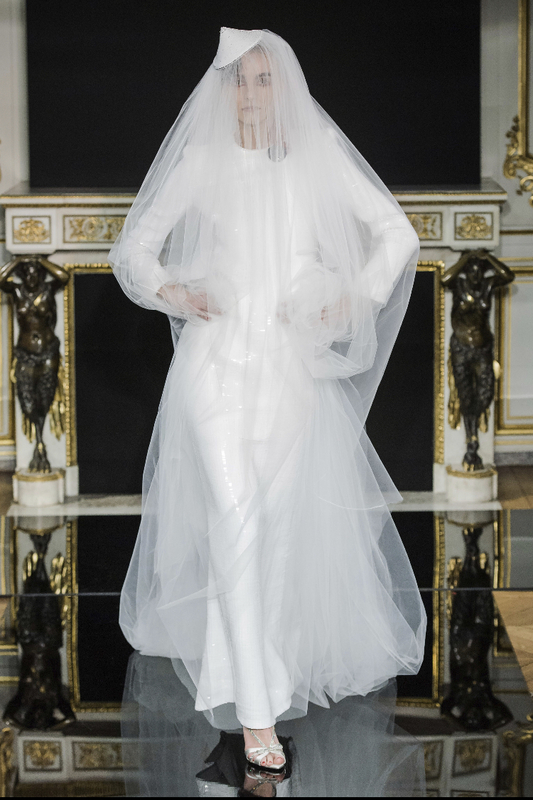 Paying attention to the Amazons of couture week can give the trendy bride-to-be or opportunistic wedding planner a leg up in the competitive world of matrimony. Someone following this past couture week would observe two common trends among the couture brides: tulle and legs. Already a staple of traditional bridal wear, tulle, or sheer fabric in general, is expected when discussing wedding apparel. At the shows, it can often be a helpful hint in discerning between what is meant to be a wedding dress versus elaborate evening wear. This season is no different, save the distinction of the extent to which the gossamer fabric was incorporated. Many dresses appeared to be made of simply nothing but tulle. Giambattista Valli adapted his signature puff tulle skirt that explodes out of a nipped waist like a Surrealist twist on the New Look (think Rihanna at the 2015 Grammys). Valli rose his mass of tulle to extend above the waistline by swapping the skirt for a cloak, wrapping around the shoulders and draping down to the ground to form a train. The puff tulle cloak forms a silhouette kin to the ruins of a Mayan Temple, contrasting starkly with the short mini dress worn under it (Vogue Italia). Similarly, designers Giorgio Armani and Alexandre Vauthier produced wedding dresses made almost completely of sheer fabric. Regardless of what percentage of these three dresses are actually made up of tulle, the fabric shapes the silhouette and dominates the aesthetic of each piece. Equally true of these pieces is their accentuation of the legs. Valli and Vauthier produced short dresses, leaving the legs bare and framed by the tulle of the gowns. Armani covers the legs in a slim floor length gown that clings to each movement of the leg, emphasized by the haze of tulle that makes it hard to determine what is underneath. This play between fabric and flesh reoccurs throughout the entire season. Gaultier exhibits it in his seemingly half finished finale piece by using pleated tulle as a tool (pun intended) in forming the dress’ geometric structure that leaves the legs exposed. What looks like a deconstructionist interpretation of bridal wear creates an hourglass silhouette that emphasizes the head and lower legs. Gaultier perpetuates this emphasis through the use of physical straight lines extrude in the direction of the two points of exposed body. Tulle is again used for this by Lagerfeld in the finale of Chanel’s show. A classic of couture, and possibly the most anticipated dress of the year, the Chanel bride closes the label’s haute couture show every season (Vogue Paris). This particular season, whether or not that tradition was honored is a matter of interpretation. An embroidered trikini is typically considered more apt at a cabana, not the altar. Nevertheless the genius of Lagerfeld created a couture bride out of an ornately embellished bathing suit paired with an equally embellished swim cap headpiece sprouting a semi-translucent silver train of tulle out of the back, flowing to the floor. The curvature and length of the dragging veil creates a sloping line that contrasts with the silhouette of the body. This contrast accentuates the exposed legs, making them appear long, thin, and powerful. Will glorified bathing suits be all the bridal rage next spring? Probably not, but dramatic veils/trains and creative uses of tulle may be on the rise. Emphasis on the legs and an embrace of less conservative bridal-wear could continue to develop. The designs of fashion, especially couture, are creative expressions of the zeitgeist. Analyzing them reveals themes that permeate throughout society and are experienced by everyone. These modern designs speak to our modern ideas of matrimony and will likely influence how those ideas evolve. Continuing to look at the designs of high fashion, as unattainable as they maybe for the most of us, will always reveal something about our culture and where it is headed. A fourth year Advertising Major at the University of Georgia with a minor in Fashion Merchandising.